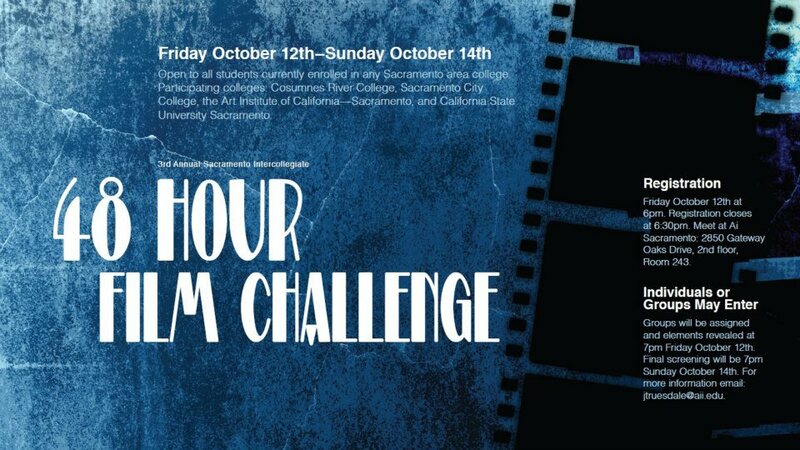 The third annual Sacramento Intercollegiate 48 hour Film Challenge. The third annual Sacramento Intercollegiate 48 hour Film Challenge is happening right now. This event started on October 12th and it’s last day is today- the 14th. Participating colleges include Cosumnes River College, Sacramento City College, the Art Institute of California – Sacramento, and California State University, Sacramento. Registration was at 6:00pm-6:30pm October 12th at the Art Institute of California Sacramento. Groups will be assigned and the elements revealed at 7pm October 12th. The final screening will be at 7pm October 14th (which is today). Tags: California State University, City of Sacramento, Cosumnes River College, film, film festival, movies, Sacramento, Sacramento City College, sacramento state, Sacramento., the Art Institute of California – Sacramento. Bookmark the permalink. Previous post ← Sacramento Is Sacred Ground!